Nearly everyone who writes likes - and needs - to talk about his or her writing, preferably to someone who will really listen, who knows how to listen, and knows how to talk about writing too. Maybe in a perfect world, all writers would have their own ready auditor - a teacher, a classmate, a roommate, an editor - who would not only listen but draw them out, ask them questions they would not think to ask themselves. A writing center is an institutional response to this need. Clearly writing centers can never hope to satisfy this need themselves; on my campus alone the student-to-tutor ratio would be a thousand to one. Writing centers are simply one manifestation - polished and highly visible - of a dialogue about writing that is central to higher education. We will host the European Writing Centers Summer Institute 2019. …you are more than welcome to visit the writing center. Find out more about our mission. The writing center offers many activities that help you improve your writing processes, such as individual tutoring sessions, seminars, workshops and events. 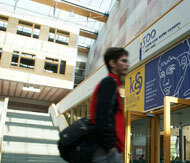 You can find us at the language centre building (August-Bebel-Straße 12 ) room 115. We are looking forward to seeing you at the writing center!